ANALYSIS OF THE ASHIMA/MIT MARS GCM by Barry S. Roffman. Ashima Research manages one of the Mars Science Laboratory (MSL) weather data sources that our site uses to post our daily Mars weather reports. Ashima also manages a blog about this weather data. When the primary Remote Environmental Monitoring Station (REMS) weather data source began to publish what seemed like a series of ludicrous, child-like mistakes, in addition to contacting JPL's public relation man, Guy Webster, I also wrote several entries for the Ashima blog pointing out what REMS and Ashima mistakes were. Every single one of them was deleted by Ashima, with most deleted almost immediately. There was no attempt to address any of the concerns, including Ashima's obviously wrong sunrise and sunset times. The question then arose as to whether Ashima had a vested interest in keeping important facts about Mars from being discussed in the public domain. In pursuing the truth pertaining to the above concern, the first question was Who are these people? The answer is that they are a team composed of scientists at Ashima Research in Pasadena, California, the John Hopkins University Applied Physics Laboratory in Maryland, the Jet Propulsion Laboratory in Pasadena, and at the Massachusetts Institute of Technology Department of Earth, Atmospheric, and Planetary Sciences in Cambridge, Massachusetts. Now, while this criticism of their approach to science and their credibility was initially posted on the DavidARoffman.Com web site because my son and I have pursued the issue of atmospheric pressure on Mars for over three years, the criticism in this article is solely that of Barry S. Roffman. David, in pursuit of his own PhD in physics, is simply too busy with his own studies in experimental and high energy physics to have the time required for the issues explored in this article. Therefore, any concerns about what you are about to read should be addressed to me alone at BarrySRoffman@Gmail.Com. With respect to who controls Ashima and what its agendas might be, their site states that “MarsWeather and MeteoMarte are provided as a service by Ashima Research. These websites are / were not funded by NASA, by any agency of the US government, nor by any agency of the governments of Spain or Finland.” But elsewhere it states, “Ashima Research is a part of the science team for the Rover Environmental Monitoring Station (REMS) – the rover’s weather station.” Further, in the Ashima paper that I will review below entitled The Ashima/MIT Mars CGM and argon in the Martian atmosphere, under their Acknowledgments section (page 1066), they state, "This work was funded by NASA Planetary Atmospheres under grant number NNX10AB42G to Ashima Research. Simulations were conducted on the NASA HEC Pleiades computer." So they first allow for no Government responsibility, and then they reveal that they are a paid part of the NASA assigned REMS team. This means that they have a financial stake in making REMS look professional and, it would seem, consistent with previous findings about the magnitude of Martian air pressure. Now, let me be honest up front. Although I have taught Earth-space science over much of my career, and although I have wrote the signed war plans for six admirals during the last four years of my Coast Guard career, I am not, like my son, a physicist. What I am is a man who reads the Mars weather reports and studies of as many experts as I can, and who posts the strengths and weaknesses of those studies. When the math in those reports is beyond my abilities, I turn to my son for assistance. Having stated this up front, I think it is important to go through the Ashima paper published by Icarus on 22 February 2012 because this paper gives us insight into the Ashima starting assumptions based on the Tillman pressure curves which are challenged throughout the Roffman research. The Ashima/MIT Mars CGM and argon in the Martian atmosphere paper is based on an effort to explain what is believed to be true about the cyclic variation in Martian atmospheric pressure on a global basis during the 669-day Martian year. Where EF(x, y,t) is the enhancement factor at any model latitude (x) longitude (y), or time (t). Armmr(x, y, t) is the model prediction of argon mmr at the Viking 2 location and at Ls 135°. As for what is meant by mixing mass ratio, it is for purposes of this discussion the ratio of the mass of argon in a sample of Martian air to the mass of all the Martian air in the sample minus the mass of argon. While this seems simple enough, their Annex A of the Ashima paper reveals that none of the (previous) published GCM results use the EF definition that they do! At this time it would probably be a good idea to look at the pressure curves shown on Figure 1 for Viking 2 (and the other landers with meteorological instruments on board). Figure 2 shows a comparison of observed and modeled argon enhancement factor (EF) for the Ashima/MIT and other GCMs. Figure 1 above - On the right, pressure curves for Viking 2 (top blue curve) and other landers with pressure transducers. The Ashima/MIT Mars GCM reference Ls at 135 is shown there and also on the MSL pressures shown on the left . Pressures measured at that Ls 135 were near the minimums for Viking 2, Viking 1 and Phoenix. On the left are the pressures published for MSL up to its Sol 861. Figure 2 below (adapted from Y. Lian et al. 2012) compares observed and modeled argon enhancement with various GCMs. There have been several atmospheric models, known as General Circulation Models (GCMs) that attempt to simulate transport (and Viking measured pressures), but as the Ashima abstract admits, "models generally do a poor job in predicting the peak enhancement in southern winter over the winter pole." While the actual EF is about 6, previous model predictions peaked at EF values of only 2 to 3. The Ashima abstract claims one of that their models (the KDM radiative transfer scheme) can obtain a peak of 4.75 (at Ls 120°). They state there that while over 50% higher than any prior model, their model remains well short of the observed value. How do the other model EFs differ from that given above for Ashima/MIT? For both the NASA Ames MarsGCM (Nelli et al, 2007) and the MarsWRF GCM (Guo, 2009) the initial non-condensable mmr is used as the denominator rather than the predicted Viking 2, Ls = 135° value. Ashima indicates that this has a modest effect (20%). Ashima uses a scaling to correct for the difference. The LMD Mars GCM is not so simple. Its creators, Lefèvre and Forget, (2009) were concerned about the validity of the argon measurements, and thus they focused on the general shape of the argon enhancement curve rather than on its absolute value. Their EF presumably (but not definitely) with an equation like the Ashima/MIT Eq. A.1 is about 3 to 4. The issue of stuck pressures and instrument reliability is highlighted in limited fashion on Figure 3 below, and in a greatly expanded manner in Annex C of our report, HIGHER THAN ADVERTISED MARTIAN AIR PRESSURE. As it shows, while temperatures and winds often varied greatly, for long periods of time there were no changes in Martian air pressure. Since the Ashima/MIT CGM places an enormous emphasis on what was happening at Viking 2 on Ls 135, let's check the facts for it as taken from Professor Tillman's Viking Project site. Click HERE for Year 2. Figure 3 shows what was found for each of two Martian years between Ls 135.001 and Ls 135.987 (each period involving three sols). For the second Martian year, every single pressure was exactly 7.47 mbar. During this period the temperatures varied from -12.28° F (-24.6° C) to -117.71° F (-83.17° C). Winds reached 6.7 m/s (about 15 MPH). The wind direction varied from almost every heading, and yet there was no variation whatsoever in the reported pressure. In fact, the situation is worse than this. As is highlighted in color on pages C-27 to C-31 in Annex C of our Report, the period of time during which pressure was stuck at exactly 7.47 mbar began at Viking 2's Sol 700.5 (at Ls 133.079°) and it extended until Sol 706.46 at Ls 136.068°. There were 150 hours worth of straight stuck pressures reported. This seems a bit too hard to believe, and indeed it does not at all match many other days when there was an inverse relationship between temperature and pressure, as is shown for MSL on its first weather report, shown on Figure 4. What about year 1 for Viking 2? What was the pressure then? See the appropriate link to the Viking Project Site HERE. There was a tiny bit of variation, but it too was not at all believable. Of 50 pressures reported, 40 were again exactly 7.47 mbar. Now, it is important to understand that Viking surface pressure measurement and resolution were limited by digitization to 0.088 mbar (0.088 mbar = 1 DN (A-D Converter, 8 bits). An audit showed 0.09 mbar was the most common change for VL-2 on its sols 1 to 199. Between its landing in the summer on its sol 1 at Ls 118 and the end of the summer at Ls 180, there were 4,476 pressures recorded between a low of 7.38 mbar and a high of 8.96 mbar. About 78.57% were either no pressure at all or one of 19 specific pressures, usually 0.09 mbar apart (see Table 1). The remaining 27.26% were apparently the result of interpolation and/or the cubic-spline technique. Fully 21.64% were exactly 7.47 mbar. Table 1 – Specific pressures reported by VL-2 for its first summer on Mars. Look at the pressures that were not 7.47 mbar on Figure 3. Using the .09 mbar pressure difference that Viking 2 could report, we would expect pressures that were immediately higher than 7.47 mbar to be 7.56 mbar, and pressures that were lower than 7.47 mbar to be exactly 7.38 mbar. Two of the 10 pressures that varied from 7.47 mbar in Year 1 were indeed 7.56 mbar. Some of the remaining 8 are interpolations, but this would not work for the following pressures reported: the 7.59 mbar reported between two incidents of 7.56 mbars, the 7.45 mbar between two reports of 7.47 mbar, the 7.51 mbar between two reports of 7.47 mbar, and the 7.46 mbar between 7.51 and 7.47 mbar. During year 1 with the pressure on exactly 7.47 mbar on 40 out of 50 reports, temperature varied from -26.37° F (-32.43° C) to -114.84° F (-81.58° C). Winds reached 5.4 m/s (about 12.1 MPH). It is our contention that the Tavis pressure transducers on Viking 2 were broken or clogged with dust on landing. We believe that the pressures they reported are totally unreliable, and as such, the need to do obeisance to the Tillman pressure curves (Figures 5A and 5C) developed as a result of the Vikings is unwarranted, and this likewise means that GCMs that strive to match the Tillman curves will not succeed - as has, in fact, been true of all GCMs developed to date - 36 years after Viking 1 touched down. Figure 3 - Hourly pressures and other weather for Viking 2 for Ls 135.001 to Ls 135.987. Note how the pressure stayed stuck at 7.47 mbar, especially the 50 reports for Year 2, despite wild swings in temperature, wind. strength and wind direction. Figure 4 - While Viking 2 showed no variation in pressure over vast temperatures swings while Viking 2 was at the critical Ls 135 used as an anchor point of Ashima assumptions, probably because the pressure transducer was broken or there was an error in data processing, initial MSL data shows significant pressure changes that are inversely related to outside temperature. This relationship was seen in the overall pressure changes reported by Viking 2, but gaps like that shown on Figure 3 were common. Figures 5A to 5C - Viking lander pressure and temperature curves. Figures 5A and 5C were published by Professor James Tillman, Dirrector of the Viking Computer facility. Figure 5B is Figure 5C inverted. This is our way of showing how (inversely) the pressures and temperatures were related (which was shown true in Figure 4 above too for the MSL). Gamma Ray Spectrometer (GRS) argon measurements. The GRS instrument measures argon quantities in Martian air due to gamma rays emitted by from 41Ar decay. This is created by neutron capture by atmospheric 40Ar. The output of the device is the ratio of argon to titanium. Strangely, the article states that the Ar/Ti ratio is “directly related to the atmospheric argon column mass density, but by an unknown constant." Basically, from the measurement of argon on the ground at Viking 2, what is constructed is a modeled argon mmr and a modeled value at the VL2 location at 48o North. But the attempt to construct a successful model is not easy because as one pole has carbon dioxide condensing out, the other one has it sublimating. There are issues of eddies that Ashima tries to account for, and effects of radically varying topography. There are also questions of what altitude should be used for argon measurements. More, the conditions at the south pole are not well understood. Ashima admits that while the GCMs show that "the southern polar atmosphere does retain 'freeze distilled' argon, they indicate a much less effective isolation than recorded by the GRS data." As for the accuracy of that GRS data, on page 1066 they state that "Based on concerns about the validity of the GRS argon measurement, Lefèvre and Forget et al. (2009) focused on the general shape of the argon enhancement curve rather than on its absolute value." Mars Exploration Rover (MER) Alpha Proton X-ray Spectrometer (APXS) Argon measurements. Ashima discusses an argument that the argon magnitude EF=6 is inconsistent with Alpha Proton X-ray Spectrometer (APXS) measurements of the MERs. Obviously if Ashima and everyone else is chasing data from flawed instrumentation (as we believe is the case with pressures linked to clogged or broken pressure transducers), then the entire attempt to match argon enhancement factors (where error bars are large) is an exercise in futility. But in reading through Ashima's attempt to rebut the APXS measurements we find, "It is also more likely a result of the fact that during the southern autumn, the APXS data actually record a dilution of argon mmr resulting from the sublimation of the northern ice cap. Thus the fact that argon mmr changes at the MER landing sites does not refute a very high degree of southern polar vortex isolation during the early phase of southern cap formation, and especially for the very center of the ice cap." The part of the text just emphasized in bold print relates directly to part of our Basic Report. The issue is can the carbon dioxide is freezing out of the atmosphere at the south pole at its winter strongly overpower the carbon dioxide that is sublimating out of the disappearing north pole during its summer? 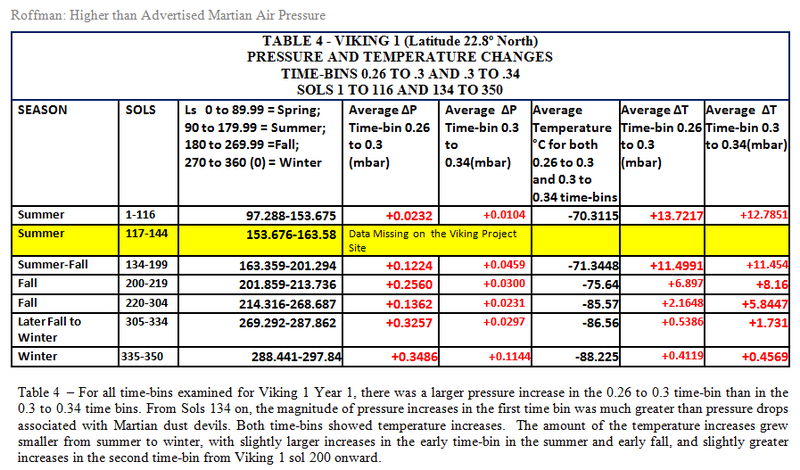 Did the Viking's Tavis pressure transducers give us a true picture of Martian air pressure when they showed us the annual decrease in pressure, especially at VL-2 at 48 degrees North in the summer there, or was the decrease on pressure reported merely due to less heat being pumped in from the RTGs to the pressure transducer behind a clogged dust filter? Towards this point let us now look back at Figure 1, focusing on Ls 135 (the middle of the northern summer and middle of the southern winter) shown on Figure 3; and Ls 270, the start of the northern winter and southern summer. The data for Ls 270 for both Viking 1 Year 1 and Viking 2 Year 2 is shown in Figure 6. The Viking 1 data is taken from Professor Tillman's Viking Project Group data for VL-1 sols 200 to 350. 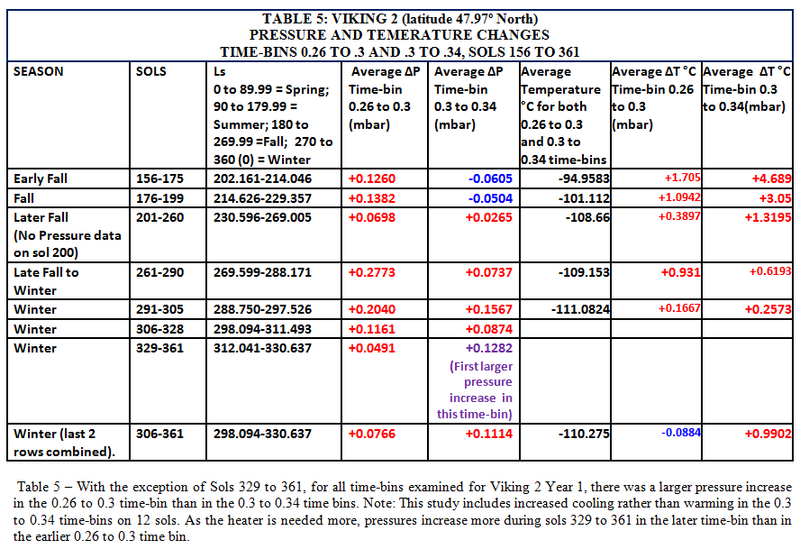 The Viking 2 data is from the same site for VL2, Sols 200 thru 399 and VL2, Sols 800 thru 999. FIGURE 6 - Comparison of Viking 1 and Viking 2 Pressures for Ls 270. What kind of pressure difference should we expect just due to the elevation of Vikings 1 and 2? Viking 1 landed at 3.627 km below Mars areoid. Viking 2 landed at 4.502 km below areoid, where pressure would be expected to be higher. But how much higher given the difference in elevation of 875 meters (2,871 feet)? Using a scale height of 10.8, and an average pressure of 6.1 mbar at areoid, the average annual pressure at Viking 1 should be about 8.535 mb, while for Viking 2 we would expect about 9.257 mb. The difference is 0.722 mbar. Viking 2 landed at 48.269° North, where as we see looking at Figure 6, it got considerable colder on the winter solstice (Ls 270°) than what was experienced a Viking 1, which landed in the tropics at 22.697° North. So given the fact that carbon dioxide is freezing (condensing) out of the atmosphere over the North Pole, we might expect the pressure to perhaps not be as high there are it is in the tropics, where at least on Earth, the atmosphere is thicker anyway. But in fact, the average pressure between Ls 270° and 271° was 9.771 mbar for Viking 2's Year 1 and 9.937 mbar for the same period for its Year 2. During this same period for Viking 1 the average pressure was only 8.793 mbar. So for Year 1, the average pressure was 0.978 mbar higher (97.8 Pa) than expected at Viking 2, and for Year 2 is was 1.114 mbar (111.4 Pa) higher than projected. Whatever carbon dioxide was supposed to be sublimating at the South Pole where it was summer solstice did not seem to affect the much closer Viking 1 as much as it allegedly did the much further North Viking 2. One degree of latitude difference in Mars is about 59 km, so Viking 2 at 48.269° North would be about 1,509.81 km (938.15 miles) further north than Viking 1 at 22.679°. COMPARISON OF DATA SETS FOR Ls 135° (MID SUMMER) AND Ls 270° (WINTER SOLSTICE). It is our contention that Ashima Research, and everyone else at NASA and JPL, is wasting their time in trying to match their General Circulation Models (GCMs) with Viking pressure transducer data that was flawed from landings on due to dust clots at their tiny dust filters. The Ls 135° data was presented above as Figure 1. For Year 2 there was zero variation from 7.47 mbar (hPa) over 50 hourly pressure readings between sols 704.34 to 706.30. For Year 1 the story was almost identical. Forty out of 50 hourly pressure readings were again 7.47 mbar. For the 10 values that differed, the full range was from 7.45 to 7.59 mbar. Only three pressures (two at 7.56 mbar and one at 7.59 mbar) were plausible given that the Tavis transducer's resolution was limited by digitization to 0.088 mbar (0.088 mbar = 1 DN (A-D Converter, 8 bits). Basically, at Ls 135°, we are looking at nonexistent pressure changes during the summer. The exact method of control for delivery of heat from the RTGs to the Viking transducers was not made clear to me when I interviewed Professor James Tillman, Viking Computer Facility Director. Was it preprogrammed, set to a thermostat, or linked to radio control from Earth? Whatever the case, the pattern of predictable diurnal pressures did not appear until the fall season. For the summer in Year 2, although temperature changes varied from -24.6° C (-12.28° F) down to -83.15° C 117.71° (-117.71° F), and although the wind strength and direction varied, the pressure needle never budged, almost certainly indicating an equipment malfunction on Mars, or a personnel malfunction such as those documented on this site in reference to published REMS and Ashima weather reports with ludicrous pressure unit confusion, wrong Martian months listed, wrong sunrise and sunset times, wrong (never, ever changing) wind direction and strength, and no relative humidity published. If the RTG did not come on during Ls 135°, and if the transducer was isolated from ambient Martian conditions, the steady (Year 2) or very near steady (Year 1) pressure is easier to understand. The pressure picture is much different for Ls 270°. At the winter solstice for sure NASA wanted the RTG pumping heat into the transducer. Temperatures at Viking 2 varied from -146.06° C (-98.92° F) down to -117.34° C (-179.21° F). Temperatures at Viking 1 only varied from -49.36° C (-58.65° F) down to -95.14 C° (-139.25° F). Pressure variation at Viking 2 was 10.2 mbar (year 2) down to 9.58 mbar (year 1). 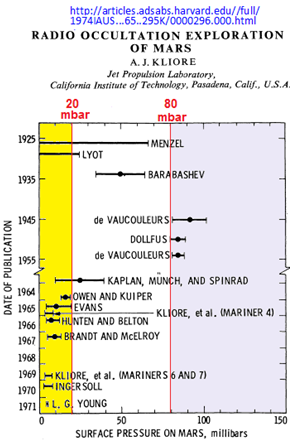 Pressure variation at Viking 1 was 8.94 mbar (year 1) down to 8.58 mbar (year 1). We will next focus (with Figure 7) on how pressure varied for Viking 1 at Ls 270° and for the period between Ls 269.282° until Ls 287.862°, which specific emphasis in the pressure changes between the 0.26 to 0.3 time bins and the 0.3 to 0.34 time bins each morning. Notice that one change during the 0.26 to 0.3 time bin (hour) at Ls 286.576° (sol 332.3) was a whopping 0.62 mbar (62 Pa), which is more than 10% of the 6.1 mbar average pressure at Mars Areoid. The change during this time bin for Ls 270.6° was 0.09 mbar (9 Pa). The average change for this time bin between Ls 269.282° until Ls 287.862° was an increase of 0.32568 mbar with no decreases in pressure, whereas the next hour (the 0.3 to 0.45 time bin) only had an average increase in pressure of 0.02967 mbar with 11 instances in pressure drop out of the 22 pressures listed. The Martian clock is shown to the right on Figure 7. The time at 0.3 each sol was equivalent to 7:30 AM on a 25-hour day), while 0.34 equates to 8:30 AM. It appears that at the 0.26 to 0.3 time bin heat was pumping into the transducer, whereas in the 0.3 to 0.34 time bin that pretty much stopped. These cyclic pressure increases, detailed in excruciating detail in the Annexes of our report, HIGHER THAN ADVERTISED MARTIAN AIR PRESSURE, and important proof that the pressures transducers were not measuring ambient pressures on Mars. There is a link HERE to a chart of Viking 1 sol 1 to 116 and Viking 1 sol 134 to 350 time bins 0.26 to 0.3 and 0.3 to 0.34. There is an amazing consistency for more pressure increase in the 0.26 to 0.3 time bin compared to the next hour. No data was available for VL-1 sols 117 to 133. The same time bins are examined HERE for Viking 2 for its sols 156 to 361. Again there are always pressure increases in the first time bin, but that's not so for the second one. (1) The Ashima model over-predicts polar warming 10 to 20 K above MCS observations during the southern summer. (2) The Ashima model does not produce a maximum eddy mixing of argon away from the poles near 50 Pa (that is, the altitude where pressure is expected to be down to 50 Pascals, which is 0.5 mbar). (3) Ashima claims that their model predicts as much as 26.5% of the atmospheric mass CO2 condenses to form seasonal ice caps during a Martian year. They state that this is slightly higher than the 25% from GRS observations, within the range of NASA Ames and MarsWRF CGM predictions of 26 to 30 %. But then they go on to state that "all Mars GCMs predict ground CO2 ice mass to be 16 to 25% higher than observations IF they are to match the Viking Lander Curves. It is the third statement above that really points to the problem. Just how accurate are the Viking Pressure Curves? This is the Achilles Heel of all CGMs. It is what my son and I spend 450 pages attacking in our Report. Here I will diverge from my son's approach to science. David thinks that the mistakes made by the REMS Team and Ashima Research on their public relations web sites are trivial, and that all that matters is what they publish in peer-reviewed scientific literature like the article that I have been reviewing here. I, however, believe that everything published or said by scientists about their studies is significant. I think this way because I wrote the war plans for six U.S. admirals between 2003 and 2007 and I know that if I publish wrong guidance it could cause some of our people to get killed. The same is true with respect to Martian weather. A dust devil the size of a large tornado on Earth would probably not be fatal if the average pressure is 6.1 mbar, but it probably would be fatal to astronauts if the real pressure were more like the 742 to 747 hPA that REMS published from September 1, 2012 to September 5, 2012. If the REMS Team or Ashima allow material to be published that they know to be wrong, that has been brought to their attention, as I have done via JPL and numerous unanswered (deleted) blogs to Ashima, then I believe that what is published by them in any other forum is suspect. I want to know why they allowed wrong information to be put out in their names. What agendas might they have, and what are the implications of their challenging of accepting ideas. In the case of Martian atmospheric data, does it match what we can see with our own eyes, or at least with the cameras that we put on the planet and in orbit around it? When REMS published 5 days of data with pressures between 742 and 747 hPa, aside from my belief that it was due to carelessness on their part, I asked my son about what he thought the real pressure is there. I have suggested pressures as low as 51 hPA, but David points to the tremendous storms with 10-km wide eye walls each year that form over and above Arsia Mons, where pressures are supposed to be 1.3 mbar (1.3 hPA) or less. He thinks that to support such storms Mars must have pressure equal to or greater than that seen on Earth. Of course, our Report was written because we could not see how dust devils could form so often on a world with nearly no air. Saltation hypotheses aside, frankly global dust storms that cover even Olympus Mons are also hard to understand with accepted pressures. For me, data is not about mere numbers. Data is only credible if the people who generate and publish it are credible, if they have the freedom to write that accepted ideas are wrong, without threat of loss of jobs, prestige, or contracts. More, when possible, I want to talk to or meet (in person if possible) the people who stand behind the data. In fact, in the end, for me it's always more about the people than about what their numbers indicate. Who are the people that David and I have spoken to or communicated with extensively by e-mail? (1) Professor Andrew Ingersoll at CalTech. We have our debate with him at DATA DEBATE. If you click HERE you will see that his figures (based on the Mariner radio occulation experiments) for Martian air pressure were accepted between 1969 and 1970. That was well before the first Viking landing. (2) Dr. John Brandenburg. If you read the link just provided, you'll notice at the end a reference to his latest scientific book: “Life and Death on Mars: The New Mars Synthesis.” It says the book deals with the evidence that a large asteroid impact on Mars late in its geologic history may have collapsed a persistent greenhouse regime on that planet, and that such a climatic collapse may have triggered a mass extinction of life there." This is a good example of how the fear factor that dominates science makes it tough for scientists to consistently write what they really believe. In fact, as we discuss HERE, in addition to an asteroid impact, on page 180 of his book, he goes far beyond his paper which was published by the 42nd Lunar and Planetary Science Conference in 2011. There his argument was for a natural nuclear explosion on Mars similar to one at Okla in Gabon, Africa. But in his book he espouses the idea of an ancient Martian nuclear air burst carried out with great malice by a great (but not compasionate) Intelligence. Although he and my son were speakers at the International Mars Society in Dayton, Ohio in 2010, we did not come to really know him until 2011. My son didn't take away the idea that it was career enhancing to fight the Martian air pressure debate. After seeing how Mars affected Brandenburg's career, David switched his career goal to experimental physics. He doesn't believe that our Government will allow the truth to be known. course, if Brandenburg is correct, then we have a motive (other than incompetence) for NASA/JPL keeping the truth from us, and for its feeding our scientists bad data that never matches up with a GCM, no matter how clever it is. Brandenburg has staked out a hard position to support. His book, however, was putout too fast after the press (Fox News) covered his paper on the natural explosion. It is in serious need of a major edit, and until that happens, he has little chance to be taken seriously. In his e-mail of 12/15/09, Kahanpää made clear that there was no extra filter. But as we discuss in our Basic Report under Section 2.4, there were other problems with the Vaisala transducers shown HERE. (4) Dr. Robert Zubrin. My son has attended three of Zubrin's International Mars Society conventions (2008, 2010 and 2011). David was a speaker at two (Dayton in 2010 and Dallas in 2011). I was with my son for the last two conventions cited, and I was a speaker in 2011. We asked Zubrin to write a letter of recommendation for grad school. Zubrin consented and it's published HERE, but David never sent it to any school because he thought that there was more opportunity to make a great discovery in another branch of physics that was not subject to the politics that we encountered in our Mars studies. In fact, there's plenty of politics everywhere in physics, but (Higgs Boson "God particle aside) it usually doesn't touch ideas with religious significance the way that Brandenburg's ideas do. As for my impressions of Zubrin, he's an engineer who wants to solve engineering problems. He told me that he was not a meteorologist. You don't have to be one to understand the evidence that we have compiled, but when he told me this, I surmised that the evidence we had was too hot a political potato for him. You only have to watch him for a minute HERE (please don't miss it) before the U.S. Senate Congress to understand what I mean. His question to the Senate, "Why are we still stuck in low Earth orbit?" can only be answered in truth when the data that we have uncovered starts to be taken seriously. He mentions a big sense of disappointment almost verging on betrayal. His only mistake at the Senate hearing was that what has been going on does not verge on betrayal. It is betrayal. Scientists and academics cannot publically make such a profound conclusion because of their careers and Government taboos. I can because I'm retired and no part of my retirement is derived from NASA, JPL, or any university under government contract. (5) Professor James E. Tillman. When David made his presentation to the International Mars Society Convention in Dayton in 2010, the first question he asked was, "What does Tillman think?" Later David was given a correction to an early assumption based on a poorly worded text by Professor Ingersoll. My son quickly published a correction to that. But as for Tillman, you only have to look at his web site to know that he is a man who has devoted his life to Mars and to education. In our initial encounters, however, he was condescending. We were challenging his life's work, and he was sure of his findings, and most importantly, the pressure and temperature curves shown above on Figures 5A and 5C. But when we turned Figure 5C upside down and came up with Figure 5B, we turned his world upside down too. There came a day when out of the blue David received an e-mail apology from him. He indicated that his relatives had asked him to send it. We don't know who he meant - family or JPL friends with a guilty conscience. I did have the chance to debate him by phone for about an hour at least once. David was young, so he was probably too intimidated by the Professor's legendary reputation with respect to Mars research. But for me, it was one old guy against another. It was apparent to me that Tillman wasn't in good health. He couldn't refute our findings with anything more than the fact that other findings, such as radio occultation, seemed to agree with his figures. We discuss that in Section 5 of our Basic Report. I can't say that he was convinced, but I honestly felt that he might have been. I also got the impression that even if he was swayed he would never be permitted to say so in public. If he's reading this now, I'd ask him to reconsider because so long as his pressure curves are the Gospel, we're unlikely to see funding for a manned mission to Mars. FIGURE 7 - The Viking Project data divides every Martian day into 25 time-bins (hours), each ~59 minutes long (see the table on the right side of this figure). Annex A Appendix 5 emphasizes how pressures change during morning times-bins that correspond to 0630 to 0830.